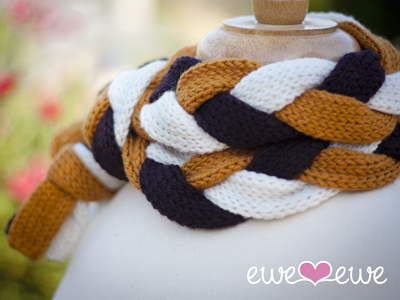 Here's a quick knit with a fun twist. 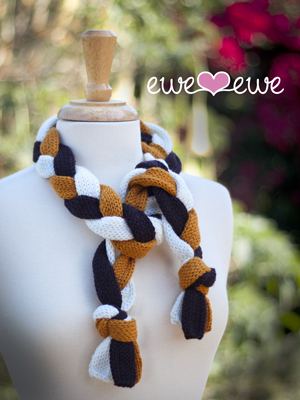 The Totally Tubular Scarf knitting pattern made with Wooly Worsted is three i-cords braided together. It's perfect to wear on cooling autumn evenings when you just want a bit of warmth. The Totally Tubular Scarf is a funky twist on a classic look. I think I'll pair mine with a corduroy blazer for the office. Completed Measurement: 53 x 2.5"
Using Color A cast on 11 sts. Divide stitches on to two or three double-pointed needles and join in the round being careful not to twist the cast on stitches. Repeat Round 1 until 18" of yarn remain. Bind off. Repeat pattern for Colors B & C. Weave in all yarn ends. Gather three knitted tubes together and tie a loose knot 2" from one end. Braid tubes and secure with a loose knot at the other end. Style with your favorite outfit and look hip and happening! Click here to download the free knitting pattern PDF.